Use Windows Photo Gallery to browse your photos. Windows Photo Gallery allows you to quickly sort through hundreds (or thousands) of your photos. Your Pictures folder, located one click away on the Start menu’s right side, easily earns kudos as the best place to store your digital photos. But when your Pictures folder grows too crowded for easy viewing, fire up Vista’s new Photo Gallery Viewer: Click the Start button, choose All Programs, and click Windows Photo Gallery. 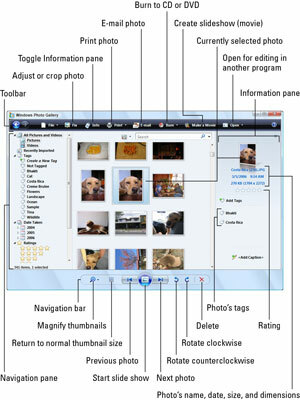 Shown in the following figure, the Photo Gallery offers oodles of ways to sort quickly through thousands of photos by clicking different words, dates, and ratings listed on the Navigation Pane along the viewer’s left side. Double-click any photo to see a larger view, and then return to the Gallery by clicking the Backward arrow in the upper-left corner. Sort through your pictures chronologically, by subject, or by your personal rating. All Pictures and Videos: Click this option to see all your photos and videos, sorted chronologically by the year you snapped them or dumped them into your PC. Recently Imported: This option provides a handy way to find pictures you’ve just added to your PC. Tags: Remember the tag you assigned to your photos when importing them from your digital camera? The Navigation Pane lists those tags, ready to retrieve their matching photos with a click. Date Taken: This option lets you see all the photos taken in a certain year or month, or on a certain date. Ratings: Spot a photo that’s a real keeper? Or perhaps a stinker? Hold down Ctrl and enter 1, 2, 3, 4, or 5, with 5 meaning it’s an absolute favorite. Folders: Click any folder listed here to view photos stored in a particular folder. By mixing and matching dates, tags, and ratings, you can ferret out the particular photos you’re after.